The Rocky Mount Meezers: It's My Sixth Birthday!!! 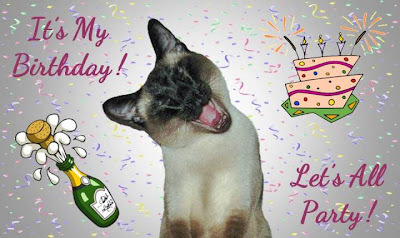 I want to party on my birthday with you furriends, let's all have a blast ... woo hoo!!! Seriously Simon, we want to party too, but we first want to point out how you progressed from such a cute kitten with those big ears into such a handsome mancat who finally grew into those ears, thank goodness! Happy Birthday, Simon, we love you so much ... and now let's PARTY with our furriends! Oh BTW, Momma and Daddy love you too, but they aren't invited to party with us! Happy Birthday Simon! We'd be happy to party with you!! Happy Birthday, Simon! We can't wait to party with you!! Happy Birthday Simon! We're ready to party with you. Happy birthday to you, Simon! Happy Birthday to you!! Woo Hoo!!! Happy Birthday, Simon! Glad you grew into your ears or your siblings would still be teasing you. Happy Birthday Simon! You grew up to be an astoundingly handsome Mancat. We'll be right over with some fresh nip! Happy Birthday Simon! We're wishing you many more happy years! Happy Birthday, Simon! What a precious kitten you were and what a handsum kitteh you are now! Happy Purrrrthday, Simon. 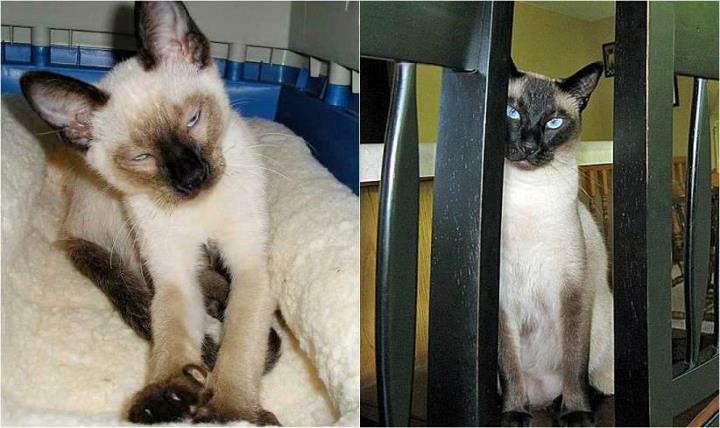 You grew up to become a gorgeous kittie. We hope you have a great time at your party. Happy Birthday Simon!!! And many more! Thanks for inviting us to this rocking party. Happy Birthday Simon, we hopes you have the most wonderful day. And you did indeed grow into your ears and become a very handsome mancat. Er sorry we were late to your party Simon. We heard today was Sam's birthday and we wanted to wish him a Happy One. Loving purrs in remembrance of your wonderful loving mom. We know how much she adored you. She was very special to us. Sabrina, Sam and Simon we are so sorry for your loss. We truly loved your Mom. We are so, so sorry to hear about your Mom. We send you all our love, purrs and hugs. We, too, are incredibly sorry to hear about your Mom. Purrs, prayers and much love to all of you, and your family. We are so sad to hear about your mom. We are sending over lots of purrs to your family at this sad time. We are so sorry to hear about your mom. Our mom has communicated with her through the CB for several years and was looking forward to meeting her next year when she came to Missouri for the football game. She will be missed. We are leaving some purrs and love for you here too, we are so sorry that Jan has gone, she was a very special cat Mom and we know she loved you all very much. We are so very sorry about your Mom. Comforting purrs to all of you. We are so sad and sorry about your sweet Mom. Love, (((hugs))) and purrs to you and your family. The loss of you mom is such an awful thing. Our thoughts & prayers are with your family. Although we did not know your Mom, we hear that she was a very sweet one. We are so very sorry for your loss. Our deepest sympathies to you and your family. We were deeply shocked and saddened by your mom's passing, and are sending soft purrs and universal Light to you all. We are so sorry that your Mom had to leave for the human Bridge. We know she loved you very much and we know you loved her too. We will miss her a lot. Purrs, prayers and (((Hugs))) to you and your Daddy at this sad time. We are sorry for the loss of your mom. We know she loved you very much and you miss her. We send lots of hugs, purrs and pawtaps for all of you and your dad. We didn't know Jan but her loss is our collective loss in the cat blogoshere. The cat community is inter-connected in more ways than we know and we hope our purring together helps. One meezer, his fur bros and mom send their condolences. I am so sorry to hear that you have lost your mommie. She loved you all very much. Your daddie is going to take great care of you and you all need to give lots of headbutts and snuggles to each other. My heart is heavy hearing that your mommie has left and I will keep her family and friends in my thoughts and purrs. I wish to offer my sympathy. It is very difficult to say anything that could reflect your loss. We here at Camp Stanhope are very sad to hear the news about Jan. We enjoyed the stories of Sam, Sabrina and Simon and also the pictures on the other blog about the lake. May the memories of love outweigh the grief of loss. We miss you so much, sweet friend. We'll always love you and we promise to keep your memory alive. You're loved by so many, Jan. Missing you so much Jan. My heart is literally aching at your loss. Love to your beloved cats, and your family.